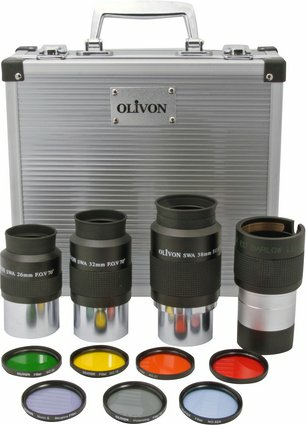 This set of Olivon eyepieces and filters is designed for refractor and reflector telescopes that accept 2 inch eyepieces. The set comes in a premium aluminium case and contains high quality eyepieces and filters. With the various filters you will be able to enrich your observations. See below for a detailed description of the eyepieces/filters. The maximum magnification can be calculated by dividing the focal length of your telescope by the focal length of the eyepiece. Mars, to increase the contrast of the polar caps, frozen areas and low clouds. Write a review By sharing your experience with the Olivon Eyepiece Tool Kit Set 2, you can help others (perhaps still doubting customers) with making a good choice.